How can we connect activities in a music session to people’s daily lives? How can we support families to embed creative music-making into their lives, their thoughts and their time? Soundcastle Director, Jenni Parkinson, shares findings and ideas from a project exploring this with families with children with autism in South East London. Soundcastle believes in the many different roles that music plays in our lives, and further, in the importance of having ownership and autonomy over this. We are constantly seeking new ways to work with families to embed creative music-making into their daily lives, to promote the lifelong benefits that music can bring. Through our recent pilot project Creative Families, we explored the idea of providing tailor-made resources to support families with children with autism to build musical activities into their week. The focus was on communication and interaction, and families learning and discovering together. Creative Families was a pilot project at Brent Knoll in South East London, a special school for children with complex social, communication and interaction difficulties including autism. 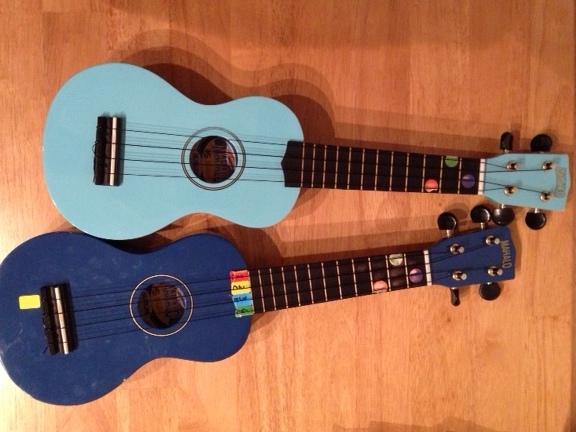 Eight families attended a ten-week after-school music session. Nine children from the school (including two siblings) between the ages of 5 and 8 came to sessions with one or both parents or guardians, with one very small baby and the occasional grandparent getting involved as well. Three of the children were pre or non-verbal. We wanted to discover how strong we could make the connection between a music session that people attend, and the activities they take into their homes. What could be the factors that link these two contexts and empower people to really embed music into their thinking and their time. Here are some of our key findings, and ideas for how to make this happen! Recordings can be a powerful way to instil pride and excitement in people’s own music. Every session we audio record the music that is made, which is then placed online, on Soundcloud, so that families can listen together during the week. We also play the recordings to the group in the following session. Often the children show immense joy when listening back to their own work, and identifying their own sounds and ideas. Most people can access Soundcloud on a phone, computer or iPad, and so can show other friends and family members. We also provide a CD of all the music created at the end of the project to all families. Parents told us that they were listening to the recordings each week between the sessions and singing along to the songs together. This can provide a simple yet motivating starting point to music-making at home. Most practitioners will be familiar with the idea of a ‘hello’ or ‘greeting’ song to mark the beginning of a session. With autistic children this is particularly relevant to mark their transition into a new space and activity, and to set-up a structure and routine that they become familiar with. Our hello song began with a very simple call and response dialogue, and a chance to sing everyone’s name and welcome them into the room. We also used Makaton signs to ensure that this was an inclusive activity, regardless of verbal ability. Each week the group added their ideas into the ‘conversation’, and so the song gradually grew and became theirs. This meant that from the first session, families had a song that was familiar, and unique to our group, that they could listen to and sing together at home. It also modelled a simple way to build music, allowing them to take ideas and try their own versions. The key challenge within the sessions is to find the balance between providing an inspiring and engaging musical experience, and keeping activities simple enough for families to repeat in their own way at home. Of course the session context will have significant difference to a home situation; access to a range of exciting musical instruments, a large group of people to share ideas with, and the support of facilitators who may also play instruments. However, the most important consideration is that the actual creative process is simple, transparent and presented in a step by step way. The process should be modelled and supported fully in the session. This can then be reinforced with a resource sheet to take away, detailing each step. Additional resources sheets can also help families to negotiate the differences between contexts. What can they use as instruments in their home? How could they adapt and change things or make their own musical games? We used activities that explored musical roles and communication, such as simple dialogue and turn-taking, or asking the child to be the ‘sound leader’ for parents to copy and join in with, as well as using simple themes such as animals or weather to stimulate sound-making. It is important during the sessions to model the fact that we are working with sound, and in an exploratory way. It may mean that some adults need to shift their perceptions of what it means to make music, and focus on the aspects of creative play and dialogue, rather than expecting to go home and practice a tune or rhythm. This is essential in promoting the communicative, expressive and relational aspects of music-making. To initiate and keep a connection between the music session and home lives, it is important to have a way of documenting and celebrating families’ music-making. We gave each family a diary, with an attendance chart so that they could add a sticker at each session. Every week we asked them to write or draw their favourite part of the session, and what they had done at home. Children were immensely proud to show off their diaries and tell us about what they had been doing, and parents began to weave the specific musical activities into their home routines. We believe that music is crucial for our lives, our identities and our wellbeing, and that everyone has the power to create their own music. By supporting whole families to take ownership and autonomy over their music-making and to enjoy, experience and create music as a part of their everyday lives we hope to keep music a living part of our grassroots culture, promoting wellbeing and connectedness in our communities. Soundcastle’s Hannah Dunster shares handy approaches and activities for encouraging music making beyond project parameters. At Soundcastle, we work to advocate that everyone has the power to make music and the right to feel ownership of it. Musical Beacons has been running since 2012 in Bow, East London. It is a music group for families with children, with community members spanning an age range of 0-70 years in an area of social housing. During this project, the community created brand new music and songs, representative of their local identity. We challenged ourselves to further empower families to continue making music at home in informal ways beyond the project parameters, thus making music an everyday occurrence in normal life. Here, we share some thoughts and activities on ways to instigate autonomy for musicking beyond our projects. Living in a profit driven society, music is promoted as something to sell, something at which you either succeed or fail. There are the musicians and the non-musicians. Like many on the Youth Music Network, at Soundcastle we believe that music is for everyone. So how do we break down this barrier? Every session at Musical Beacons is promoted as something for the whole family to attend. Children can not attend without an adult family member and the experience is for both to enjoy. This is not a place for parents to observe their children’s music-making. This is a place where parent and child create something new and meaningful together. The parents are often more nervous than the children so our first task is to create a safe space free from value judgement or externally imposed quality standards. A space where all ideas are welcomed and valued and every voice has the chance to be heard. We spend time on building up people’s confidence, helping them to understand that music is a skill which can be learned and they have as much right to it as anyone else. Through accessible instrumentation, having fun and being silly, playing games and also discussing the important aspects and stories of community life we discover how to communicate through sounds, expressing emotions and finding a shared message with other members of the local community. After establishing a safe space, we introduce ways that people can integrate informal music making into their daily lives. At the end of each session, we give families a take-home sheet with ideas for activities to try out together at home, whether that be getting out the pots and pans in the kitchen and creating an impromptu drumming session or writing a new song together. We have observed that the more informal music making that takes place at home, the more confidently people contribute to the project itself. The most important message we need to communicate to a nervous parent is that music doesn’t have to always be a special event with an audience or a panel of experts taking notes. It can and should be part of everyday life, imperceptibly woven into our daily activities. As artistic facilitator of a fam ily music project, there is a limitless range of creative activities that can be adapted for mixed ages. The most important thing is to use your imagination and shape whatever you do to the personalities of the community members themselves. The group is your starting point and their ideas are priority. Keep this in mind when choosing and delivering the example activities below. Are they suitable for this particular group? Will they give the community members the appropriate framework within which to express their own creative vision? Every project is different and Soundcastle advocates creative facilitation rather than generic workshop formulas. With this in mind, please use any example activities from Musical Beacons purely as starting points. Find out what their favourite playground game is and adapt it! Throughout the course of your project you may well develop a repertoire of songs. You can use them as games and/or warm-ups in themselves. This helps the group to internalise the words and melody without even knowing they’re doing it. We use playground games to make our rehearsal practice more fun! Here, we outline Grandmother’s footsteps but there are many more playground games you could use as inspiration. 1) Choose a volunteer (Grandmother) to stand at one end of the room, facing the wall. (They should have their back to the rest of the group). 2) Everyone else stands in a line at the opposite end of the room. 3) The objective is for everyone to creep up on ‘Grandmother’. 4) As a group, start sneaking up on Grandmother whilst singing your song together. 5) Grandmother can turn around at any point. As she does this, everyone should freeze and stop singing. If Grandmother catches anyone moving or singing, they are sent to the back. 6) The first person to reach Grandmother without being caught ‘wins’ and can play Grandmother next. Remember that you can always adapt the theme to make it appropriate for your group, e.g. Sleeping Lion (and all the other animals are sneaking up). This concept is easy for parents to grasp and takes the pressure off engaging with music at home, simply by using it as a tool within the game. If, as the facilitator, we continuously stand at the front, directing the group, we are not facilitating honestly but rather, leading. For communities to take more autonomy of their music making, they must be given more ownership of the process itself. The magic wand activity does exactly this. It is a useful activity for empowering community members to take both a facilitatory role and an improvisatory role. It also helps people to learn about melody and how you can apply it to song lyrics. It is accessible for any age group and is ideal for mixed ages. You will need to bring several magic wands to the session! 1) Explain that we are each going to paint a beautiful, invisible line in the air. Pass it around the circle in silence and watch the line develop. If you have a large group, you could ask for a smaller number of community members to volunteer to demonstrate. 2) Explain that we are now going to turn our line into music. Ask a facilitator to ‘read’ each of the lines painted and play those lines on their musical instrument. Encourage community members to explore the idea of high/low/fast/slow/stop/start etc. Explain to the group that they have been painting their own melodies. 3) Everyone now fetches a musical instrument. 4) With older children and adults: Appoint one community member as leader and give them a magic wand with which to paint their musical line. This magic wand is to be used to signal different musicians to start playing. The leader can now point to individuals and bring them in and out, as well as directing melodies, tempo and layering with the magic wand. There is no right or wrong way to interpret the line. The leader with the wand takes a facilitatory role, guiding the instrumentalist, whilst the instrumentalist gives a purely improvised response to the line. 5) With Early Years children and adults: Divide the group into pairs – parent/carer and child. Give each pair a magic wand and explain that if they use the wand to point at the other person, that is the signal that they can start playing their instrument. Encourage the family pairs to engage in musical ‘conversations’ by facilitating each other to play musical instruments using the magic wand. Note: This activity is an ideal way to introduce leading/facilitating roles and can be developed with flashcards and signals. You can also refer back to melody ‘painting’. For example, if the group has written song lyrics but isn’t sure how to sing them, encourage them to experiment by ‘painting’ potential melodies and singing the words to the line. This, once modelled within the project, indicates a simple step-by-step approach to exploring and creating melodies together at home. Here we see singing absorbed naturally into daily life without ceremony or performance. A simple and unthinking acceptance of their human right to make music. Music is for everyone. It is a fundamental part of being human. By working towards helping people to take autonomy for their own musical lives, we challenge the concept of outreach, instead promoting local music made by and for local people. At Soundcastle, we are advocating for a return to musicking as an active and living part of culture, fundamental to society and owned by all. As a consequence, we can celebrate the incredible power of music to connect people across language and social barriers and its profound and positive effect on our health and wellbeing. For more ideas for activities and approaches to family music projects and ways to encourage music making in the home, you can download the Musical Beacons Activity Toolkit 2016 for free here. Youth Voice: Hear, Listen, Amplify! Jenni from Soundcastle blogs about how to capture ‘Youth Voice’ based on learning from our Musical Beacons family music project. Soundcastle projects focus on enabling young people and their families to write their own music. Musical Beacons Charlton ran from 2015-2016 and was aimed at families with children aged 0-11, in an area of social housing. During this project, we challenged ourselves further on our commitment to youth voice, asking ourselves just how much ownership of the process can be handed over to our young musicians. We have collected thoughts, ideas and activities to bring into our practice to make sure we are hearing, listening to and amplifying the voices of your young people. Try this (best in a supportive training environment! ): Lead a creative activity with a group of people by only asking open questions. Reflect on the process. How did it feel as the facilitator? How did it feel for the group? What was the creative outcome? How many decisions did you have to relinquish control over? This is a valuable way to begin challenging all the decisions that we make as educators, facilitators or teachers. How many decisions are made before, during and after each workshop? How many are absolutely necessary, and how many could we hand over to the young people, who with the right support could take control? Here are some decisions a facilitator might make – could youth voice change these directions? – The group want to make music about a fairy, I’ll provide gentle melodic instruments. – I’ll accompany their singing on my guitar. – I’ll film their performance. – I’ll provide juice and biscuits at break time. – The song we started writing last week was great, we’ll carry on with it this week. Most people find it easier to be creative in response to a theme or stimulus. A question as open as “what shall we do?” is often not helpful. Here are some ideas that can help young people to initiate their own theme. i) Start with a place. We’re all in a place. This could be the room/neighbourhood/city/country/world/planet. We all identify with these things in our own ways, and anything could happen in any of them! Give young people the option of the place they want to think about – their neighbourhood, town, country or the world! Then they can think about whatever they like within this. They feel creatively secure, but their imaginations could go absolutely anywhere. The queen in London is so elegant, and so beautiful, her hair smells like perfume. The queen in London, she has a big parade, like so many stars, like some fireworks in the sky. ii) Start with a story. Our young musicians made music about a magic tree, with butterflies, fairies and monsters living in and around it. iii) Start with the music itself. A series of guided questions can help young people decide what kind of music they would like to make, and from there they can consider what the music could be about and how it could express that. If you chose pop music – is it a song or instrumental? What is it about? If you chose a film – what is the film about? What kind of film is it? Which scene do you want to create? Sometimes we need to support young people to develop the tools and knowledge that they need to be able to take control. We explored ways to give young people more insight into the creative process and its possibilities. Each week we played recordings of the music made the previous week and supported young people to reflect and make decisions about what to do next. We provided dedicated project diaries, and built time in the sessions to write or draw in them. This is especially effective with families, who can take time to talk and think about what they enjoyed, and think of ideas for next time, and for things they could do together at home. Example: A young person who doesn’t know how to play an instrument writes some lyrics and finds a melody that they can sing them to. A quick and easy next step is for a facilitator to add chords to produce an immediate and effective song. The slower, but more authentic, option would be to support the young person to choose their own chords. This could be by playing them a selection of different chords and modelling how their melody would sound over each one, so that they can make choices. The iPad app Garage Band is also a useful tool here, as young musician can select and hear the possible chords for themselves. Not everyone is best at making their voice heard by speaking. One of our young musicians told us in a session that she had no ideas what to write music about, but at the same time she was drawing a colourful scene of dragons and ninjas. . . Drawing comes so naturally to many young people, and can be a great way into writing music. Simply leaving paper and pens can be enough of a stimulus and children will draw straight from their imaginations. Prompt questions can also be used to encourage pictures that can be directly used in the sessions i.e. where does our story begin? Can you draw the characters? As facilitators we should embrace any art form that allows our young people to express their ideas, which can be an exciting path towards making music. Specific activities that encourage youth voice should become an integral part of the structure of a session. It may take time for young people to build their confidence and find new ways of thinking and generating ideas. If they understand exactly how and when they can contribute, the process will become safe and familiar allowing even the quietest voices to express themselves. Hannah from Soundcastle blogs about our love of Early Years project participants and how they increase a group’s potential for high-quality music-making. Ever since Soundcastle formed in 2011, our work has taken us invariably into early years contexts. This does not mean that we have been working exclusively with 0-5 year olds. It simply means that we consistently welcome them into our music groups alongside their parents and older siblings. We encourage participants to come to our projects such as Musical Beacons in their family groups, strengthening their own personal bonds through music, exploring communicating with each other in new ways and most importantly, having fun together! Why are so many activities age restricted? Who says that you are too old, too young, too babyish or too old-fashioned to take part? Music is for everybody! And when we release ourselves from the constraints of genre and start creating our own brand new sounds, it becomes apparent that mixed age groups have a natural ability to collaborate and can portray powerful and united messages through their music. Our early years participants consistently bring a whole new feel to our workshops. Completely uninhibited, they may choose an expressive dance rather than words to communicate an idea or tell a story to stretch our imagination to a level we never knew possible. With the right guidance, they have no fear to stand up in front of and lead a room full of 30 people! As a direct result of this, they inspire the rest of us, both facilitators and older participants. Adults who wouldn’t dream of dancing like starlings through the sky in front of a room full of their peers, suddenly break into flight when doing so alongside a 3 year old. As a result, our music becomes stronger and more daring! Participants lose their fear of the unknown and push their idea of what music actually is to a new level. Never underestimate the power of the early years participant to remind us of the inherent musical instinct we are all born with and the ability each of us have to find it once more! Soundcastle ha ve a range of Early Years and Family Music projects on offer throughout the Summer. Perfect for Summer Festivals, Family Days or simply a chance to brighten up the classroom as the holidays draw near, our Early Years Music Workshops always get children and adults singing, dancing and smiling together. so please contact us if you would like to celebrate the sunshine with a fun and vibrant music workshop! Soundcastle have Youth Music Funding! Hannah from Soundcastle blogs about our flagship Families Music Project, Musical Beacons and what the latest round of Youth Music funding will enable us to achieve. Soundcastle are delighted to officially announce that we are the recipients of the most recent round of Youth Music Funding! This funding will enable us to continue, develop and expand our flagship project, Musical Beacons which provides access to music for many families in Bow, East London. Soundcastle believe that everyone should have access to music. It is a fundamental part of being human, a vital communication tool and strengthens relationships in a subliminal, uncomplicated way. Musical Beacons is a creative space, free from hierarchy, where parents and children learn together and from each other through fun and interactive musical activities. Guided by highly experienced musicians and facilitators, parents and children have the chance to work together with other family groups to create their own music and songs as well as learning musical instruments. The most important thing is that the group always explores and celebrates the music they want to make right now, truly representative of them as people at the current moment in time. The result is exciting and challenging new music and as a consequence, stronger families and a close, collaborative community. In addition, this Youth Music funding will enable Soundcastle, for the first time, to expand our team in order to further our reach and potential as an organisation. We will be taking on three new associate leaders who will have vital roles in facilitating the creative processes at Musical Beacons. Whilst they will be highly experienced practitioners, Soundcastle will also guide them in our own method of facilitation, a philosophy and set of values designed to embrace every facilitator’s individual strengths and unique style whilst ensuring that the creative voice of the participants is always the fundamental musical outcome. We would like to extend our congratulations to all other recipients of Youth Music funding – these include but aren’t limited to London based organisations such as Sound Connections, Drake Music, Haringey Shed, Creative Futures and Fairbeats who are doing such exciting and inspiring work. We are so excited to begin the next phase of Musical Beacons! The first sessions take place during the week of the 10th-14th August 2015. Following this, we will run weekly sessions throughout the Autumn term (September-December 2015). It is free and open to all families so please spread the word! For more information, please contact Gail Macleod, Project Manager for Musical Beacons. Email: gail@soundcastle.co.uk Tel: 07840 524 968. If you would like to receive updates about Musical Beacons, you can subscribe to our newsletter here. For a full list of all Youth Music funding recipients for April 2015, click here. Hannah from Soundcastle blogs about our recent project with St. Mungo’s Broadway, and how equality in creative music-making can enhance well-being. In February 2015, Soundcastle participated in Fantastic February, a programme of activities at a St. Mungo’s Broadway shelter near Kings Cross. We delivered a series of music workshops during which we were able to see the positive effects of creative music-making in action. Fantastic February consisted of a range of activities from music to art, furniture painting, aromatherapy and self-advocacy workshops. For residents, who had recently left an isolated life on the streets, these experiences were stepping stones, a chance to adjust to communal situations before venturing further out into the wider community, a daunting and stressful prospect. Mental health problems are a major contributor to homelessness. Following the variety of communal workshops in Fantastic February, participants who regularly experience auditory hallucinations reported that during the four weeks they found that their inner space was quieter. It has long been acknowledged that music has the power to reduce stress. A few years ago, researchers found that music releases dopamine, a chemical in the brain that has a key role in setting good moods. During a study, levels of dopamine were found to be up to 9% higher when volunteers were listening to music they enjoyed. To create a safe space and thus combat levels of stress in our music workshops, we approach music-making using the Soundcastle methodology. * Creating absolute equality in the room is vital, therefore it detracts from the quality of the process to think of these people as vulnerable adults. In many ways, we, the Soundcastle facilitators had far more to learn from them than they did of us. Their life experience is so far beyond ours and their knowledge, opinions and feelings are vital to creating captivating new music. Bearing this in mind, we approached the sessions as a dialogue, an ongoing conversation, not just creatively but also structurally. It was a time to recognise the importance of a cup of tea, a warm sofa and a good chat. With accessible instruments nearby, such as ukuleles, balafons, drums and iPads, our conversations soon turned to music. With the emphasis placed on experimentation, trying something new with no right or wrong way, we could respond entirely in the moment, building up looping beats and grooves based on the natural ideas that flowed from their own personal sound experimentations. The idea was that if you try something new, it can be adapted by a group to create something bigger and better than you had ever anticipated. 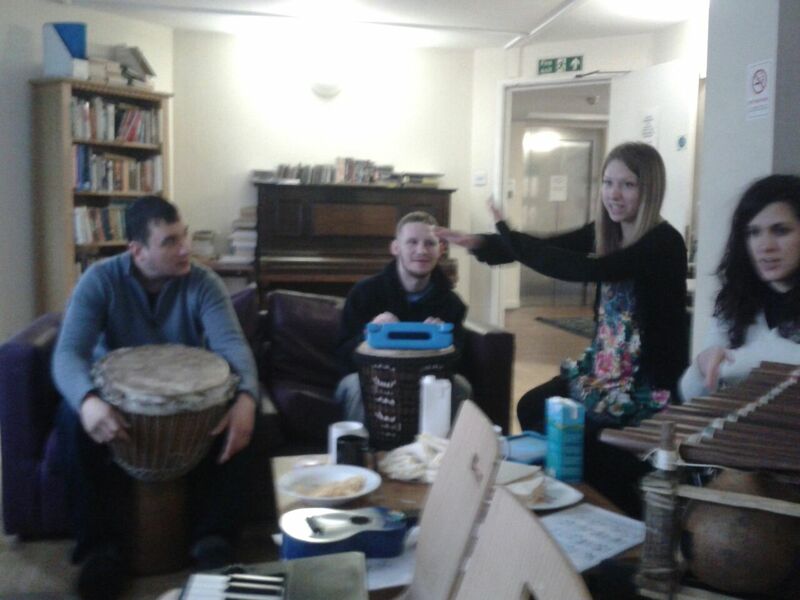 Experiencing this through music, participants had the added wellbeing effects, reducing the potential stress of taking their first steps back into communal activities.